While every *buntu and *edora moving towards Unity, Gnome3, Cinnamon or MATE, only two distributions remain practical for desktop productivity and fun, they are CentOS 6. * and Debian 6.*. They both will support the good old gnome2 line at least couple years more. However, they are a lot different from each other. Here's a short description on each of them vis-a-vis desktop use. Pros #1 clean package management. With backports repo now merged with main debian repos and debian-multimedia being very compatible with debian, you can install whatever you like without the being scarred of any adulteration, conflict or breakage. #2 largest no. of packages, roughly 30,000+. #3 flexible installation options - from netinstall, base cd to kmuto backported images, full CDs and DVDs. #4 less memory footprint and disk space usage. #5 support highest no. of architecture - from arm to amd86 and beyond. #6 frequent updates and point releases. #7 larger community and better/quicker support. #8 better hardware support out of the box with unofficial backports/kmuto installation images. #9 very flexible system offering easy customization as per individual needs #1 very responsive (better than debian) system as a workstation. #2 quicker updates to major productivity suites for office use such as - openoffice, mozila suite. #3 better tested/trusted set of packages. Cons #1 sometimes updates lose the previous configurations, especially printer, though reconfiguring manually resolves the issues #1 repo conflicts and occasional breakage of package base as rpmforge, rpmfusion, elrepo, remi, elrepo, epel and atrmps don't always work in sync. #2 lesser no. of packages in the repo. #3 no easy customization as per individual needs. Of course, the list is not complete at all and may reflect my bias towards Debian. If so, please correct me sending you feedback that'll help me revise the list. You're completely off on a few points, dpkg recognizes an update package attempting to overwrite a configuration file and will consequently prompt you for your desired action, to allow the change, deny the change, do a diff to see side by side a comparison...it doesn't just throw out old configs. On the memory end, Debian can easily install on much more modest hardware than can CentOS, with a base install, but the memory bit aside, it is really more a matter of what you run on the system. In terms of latency, that's really more of a kernel difference, you can just as easily get a low latency kernel or make your own on Debian and have amazing performance. One qualm I have is a lack of choice of file system and partitioning setup with CentOS in comparison to Debian, making data backups a bit more of an issue. Also rolling upgrades from Debian are more advanced than the Redhat/Fedora/CentOS solution of, reinstall the entire OS. I've been using Debian since Woody, but always run sid at home, I've used CentOS at businesses but would never opt to use it myself. If you want compatibility with Redhat and the ability to call a number and wait around and complain to someone who doesn't know the architecture or how to solve the problem and mostly has employees speaking at best broken english, go with something Redhat based like CentOS, if you want utter freedom and ease in system administration with no need to have someone to call up because it simply works and is heavily documented, use Debian. 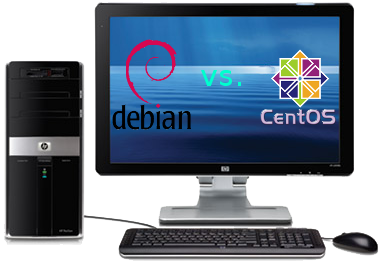 In my personal experience, CentOS for server, and using KVM, is more faster and stable under heavy load than Debian, and for desktop, the same. CEntOS (and RHEL, Scientific, etc.) is stable and fast, no doubt. But that hardly makes it a desktop candidate, especially if you consider the modern hardware. Of course, the server story might be different. Y'all should remember, not that long ago, how RHEL fscked everyone, went public, and stuck all the "community" with FEDORA. That was slimy. Now who's in-charge over there, the homewrecker Mormon who screwed up Novell and SUSE. Hmmm, go figure the Big Plan. Meanwhile, on the UBUNTU front, UBUNTU is to DEBIAN what FEDORA is the REDHAT -- a dangerous toy that will let you down hard. Go Debian and stop screwing around and being screwed up.